You are probably familiar with the most popular search engines, like Google and Bing. But did you know that these platforms have their own local search function? To take advantage of this function, you first have to understand the basics of local search engine optimization (SEO). It can be a challenging practice. Not only do you have to understand the basic SEO principles, you have to understand how to apply them locally. How Do Local Search Engines Work? Local search engines are databases of geographical information that pertain to a local business. In short, they show a business’ listing when someone performs a local keyword search. These listings would include a map of your office location and then your practice’s contact information. 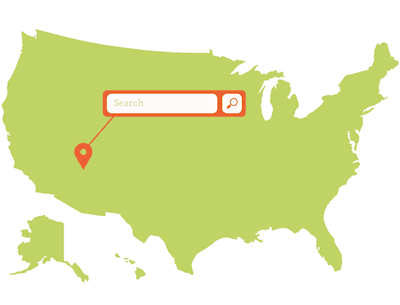 Let’s say you’re located in Iowa City and you specialize in sports chiropractic, your goal is to show up when someone searches something like, “sports chiropractor in Iowa City.” This can draw highly qualified traffic to your website. Think about it: This is a person searching for your specific services offered near your office location. Relevance: How well a listing matches what someone is searching for. Be sure to add complete and detailed information about your practice so your listing will be considered for chiropractic-related queries. Distance: How far a search result is from the location term used in a search. For example, if someone types “chiropractor in Iowa City,” Google might show the top three chiropractors within a 15-minute radius in Iowa City (the distance can vary based on the jurisdiction). Prominence: How well known the practice is. Prominence can be determined based on many factors, such as reviews, directories, and SEO best practices. One of the most important components of local chiropractic SEO is the trinity of information known as NAP (name, address, and phone number). 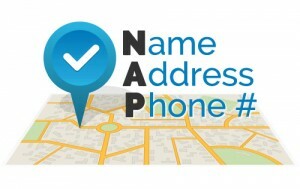 Local search engines use NAP as a measuring stick of accuracy for a practice’s existence. And in order for them to validate your presence, they must ensure that all the data aligns. Say the name of your practice is Johnson’s Family Chiropractic. If you accidentally type Johnsons’ Family Chiropractic (with a misplaced apostrophe) in your listing, then your practice might be registered inaccurately. In order for a practice to be legitimate, it has to have all three pieces of information (name, address, and phone number). Consistency is key. Your information on Google should read exactly how it reads on Bing and Yahoo. This can pose some challenges. One day, you might change your phone number. Or, you might move your office to a different location. Whenever you make a change, you must remember to update all of your listings across the web. This is something we do routinely for our clients. The importance of having accurate and consistent listings cannot be understated. It’s so important that two of the top three negative local ranking factors, according to MOZ, are: 1) Listings detected as a false business address; 2) NAP data that is inconsistent across multiple websites. Such inaccuracies and inconsistencies could kill your local SEO. While 85 percent of small businesses agree that it’s important to be found on local search platforms and directories, only half have ever updated their online listings. Caution: Sharing office space can have a negative impact on rankings because the same physical address is being shared. This can confuse the search engines, which in turn, could depress the rankings for both practices. What’s great about local SEO is that much of it is under your control. You create your listings, optimize your Google My Business page, and on and on. But there’s one thing you don’t have total control over: Reviews. It’s not easy to persuade patients to vouch for you online. But one way to do so is by sending out a new patient survey. For instance, the Perfect Patients New Patient Survey sends a simple survey to any new patient commencing care in your office. The software then detects your most delighted patients, and prompts them to share their experience online. Of course, reviews cut both ways. Equally important as gaining positive reviews is being mindful of negative reviews. Learn best practices for responding to negative online reviews in this previous post. Local listings and online reviews are two off-page factors to consider. But the content on your website is also important. Incorporating the right keywords on your web pages is a way to squeeze the most SEO value out of your content. For example, one of your most popular landing pages might be your Contact page. On this page, you’ll want to add your city/region, plus a relevant keyword in your title tag (i.e. “Contact Johnson’s Family Chiropractic in Iowa City”). In addition to optimizing your landing pages, you’ll want to use a similar tactic with other pages throughout your site. Say you specialize in pediatric. If you have a page that addresses this service, you’ll want to sprinkle “pediatric chiropractor” and your “city/region” conservatively throughout the page. Just be careful not to over-optimize. Any keywords you include must appear natural. Website engagement is another key element for boosting your local rankings. Because site owners can so easily manipulate on-page signals, Google and other search engines seem to place a high value on what website visitors actually do on your site. Do they immediately hit the back button? Do they follow links to other content on your site? How long do they spend on each page? Strategies to keep your site visitors engaged are crucial, and often an overlooked aspect of many chiropractic practice websites. If you’re not taking advantage of local SEO, you’re missing out on potential patients looking for a chiropractor near you. Optimizing your website for local search is a free way to grow your online presence. But local SEO is only one part of getting new patients from the Internet. 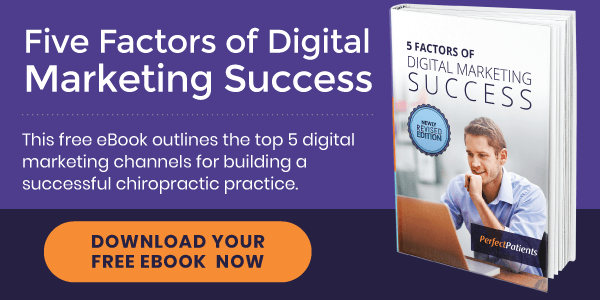 Download our free eBook below to learn more about the factors of chiropractic digital marketing.